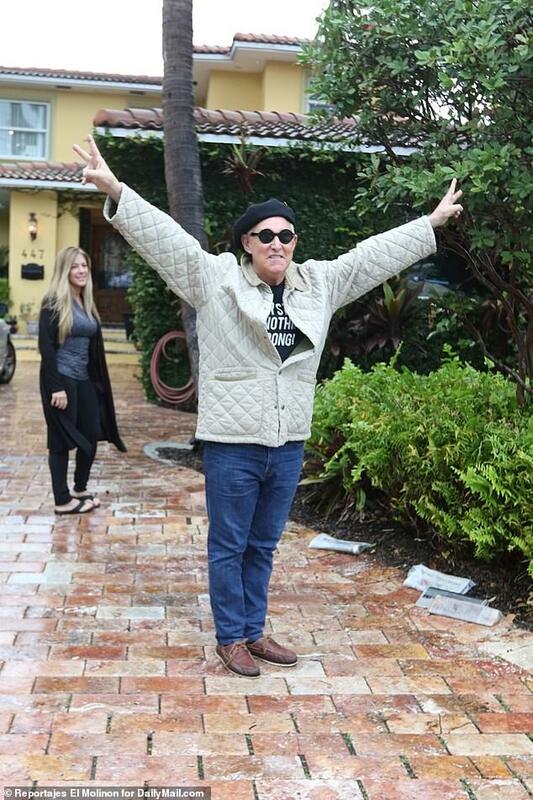 The self-proclaimed 'dirty trickster' was arrested by the FBI in a raid before dawn Friday at his home in Fort Lauderdale. 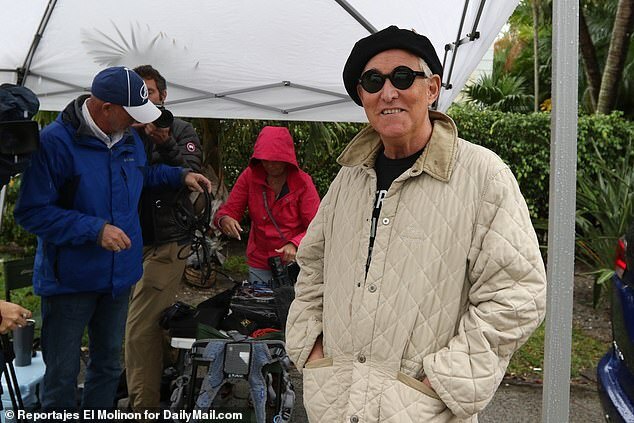 A one time confidant of Donald Trump, Stone, 66, was charged with lying about his pursuit of Russian-hacked emails damaging to Hillary Clinton's 2016 election bid. 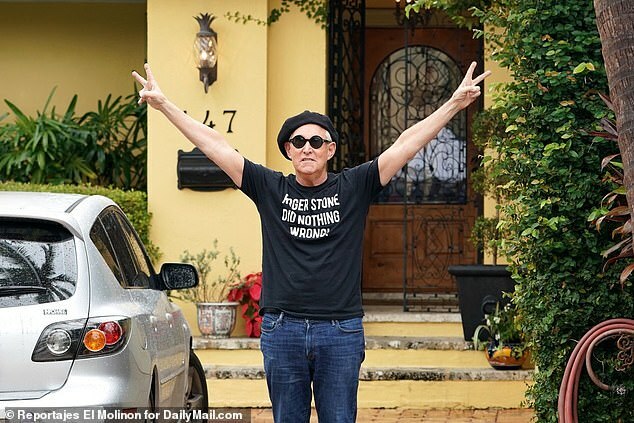 Wearing a beret and jeans, Stone also gave the double 'V-for-Victory' sign in a nod to his political idol, former President Richard Nixon. 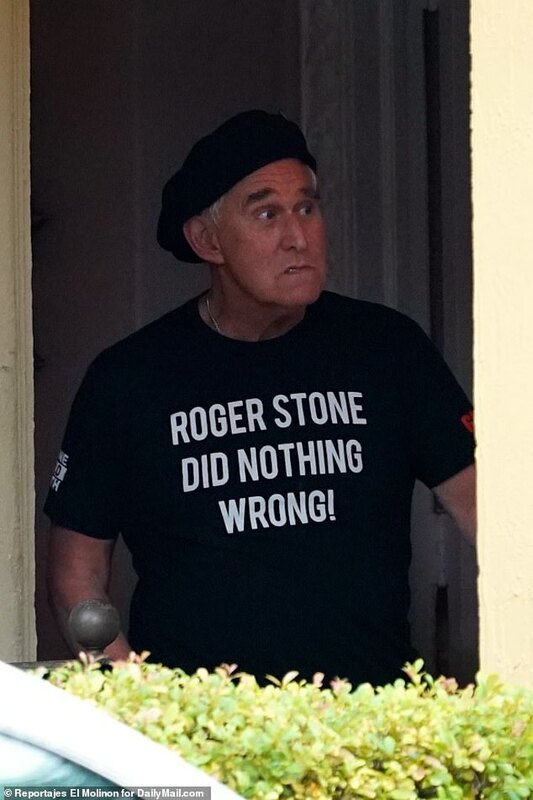 His t-shirt also contained a head shot of Nixon, with Stone previously admitting he has an image of Nixon's face tattooed on his back. 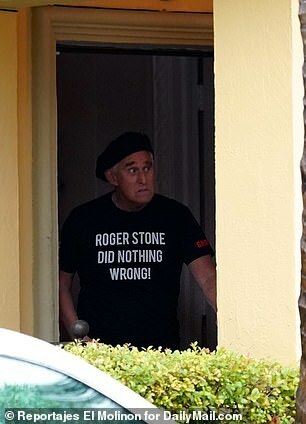 The t-shirt contained a link to the website aiming to raise funds to a newly-created website to meet Stone's legal costs. 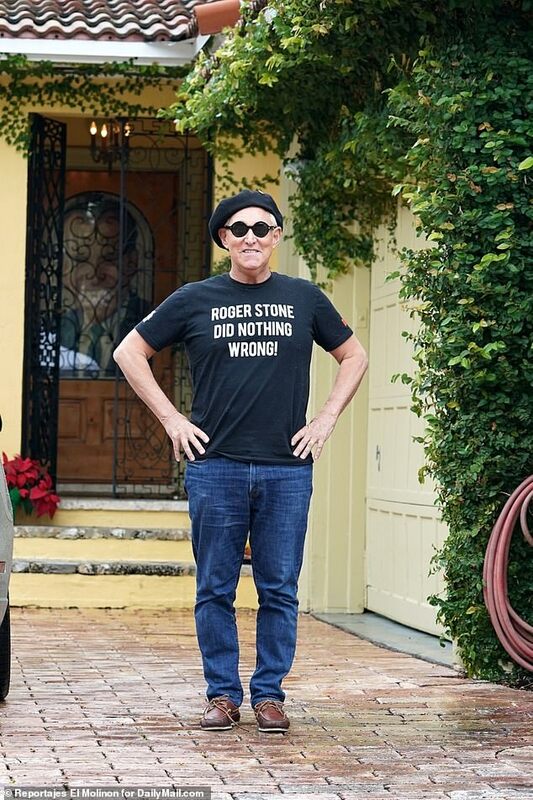 The website, rogerstonelegaldefensefund.com, contains an option to donate with no limit on the amount of money which can be donated. 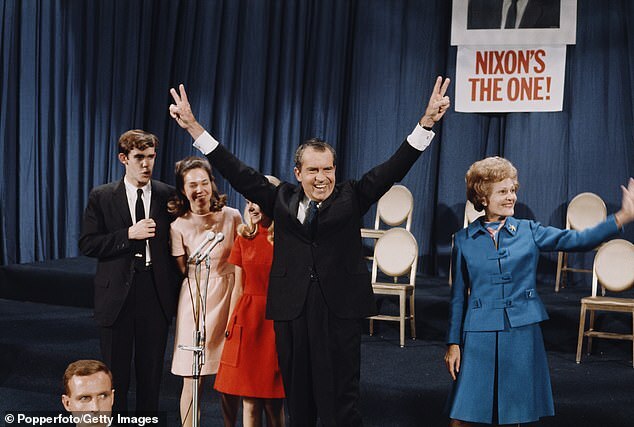 The silver-haired strategist was later seen around his home picking up his newspapers and again waved his arms in the air giving Nixon's trademark victory sign to awaiting paparazzi. He told Dailymail.com on Saturday that he believed the FBI had treated him like the notorious drug lord ‘El Chapo’ because of the way armed police swooped on his home at 6am while his wife and dogs were upstairs. He claimed: ‘I don’t believe I have a valid passport, I don’t own a gun and I’m charged with non-violent crimes and I have no prior record. 'This is an egregious overreach by Mr Muller. 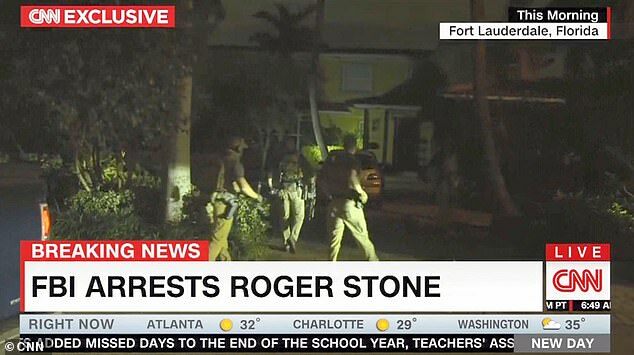 The FBI director who had to have approved this raid should in my opinion be fired over it because it’s unwarranted. 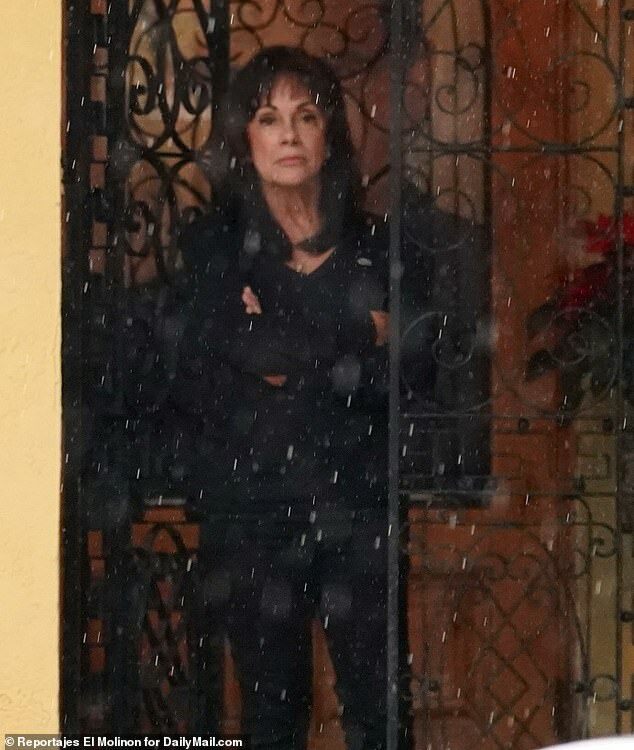 'I guess it’s an effort to intimidate me but I am not intimidated. I am concerned for my wife. One of my dogs is still traumatized and will not come out from under the bed...won’t stop shaking. He claimed 'thug-tactics' were used against him and his family when he was arrested and said he would have gone to the police station voluntarily. 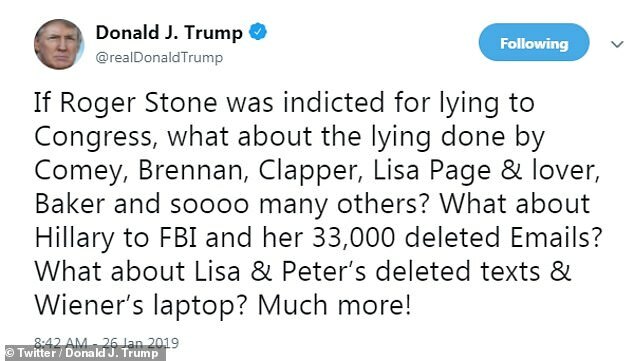 On Saturday, he again tweeted his support for Stone, this time saying: 'If Roger Stone was indicted for lying to Congress, what about the lying done by Comey, Brennan, Clapper, Lisa Page & lover, Baker and soooo many others? 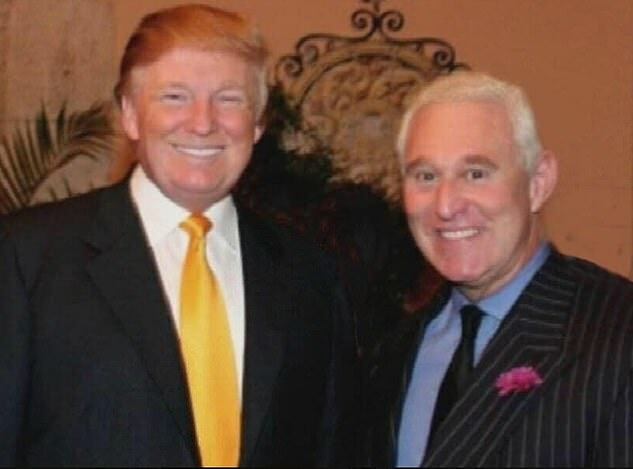 Last month it was reported that Stone had to give up health insurance because he couldn't afford it as the Russia probe has dried up his consulting business. 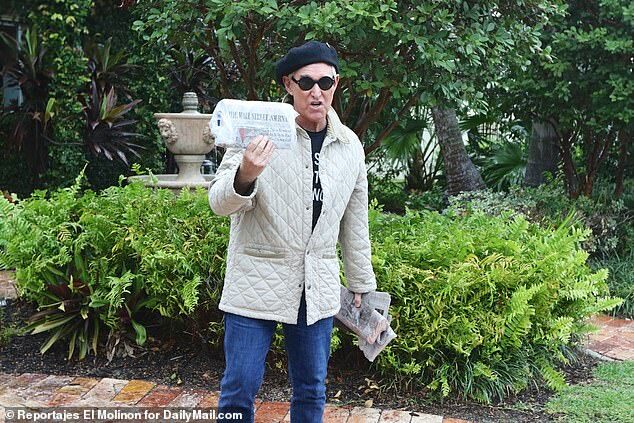 Stone has decried the Mueller indictment against him as 'thin' and 'fabricated' and said he's gearing up for a fierce legal battle as he hit the talk show circuit hours after his high-profile arrest. Speaking to Fox News' Tucker Carlson on Friday night, the former confidant to President Donald Trump declared: 'I intend to plead not guilty. I believe I will be vindicated. 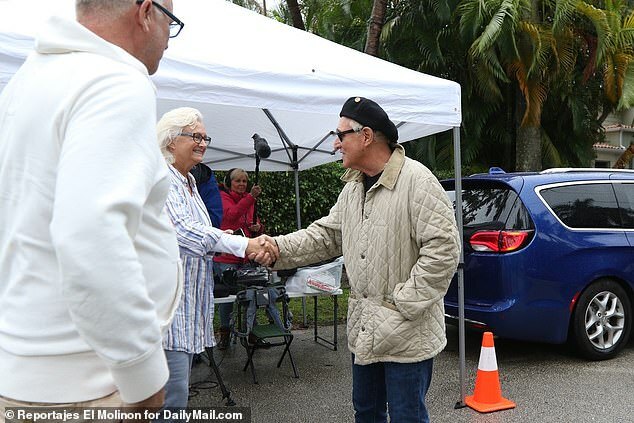 FBI agents clad in bulletproof vests arrived at Stone's Fort Lauderdale mansion with guns drawn on Friday morning after Special Counsel Robert Mueller unsealed a seven-count indictment from a grand jury impaneled in his sprawling probe of Russian election meddling. The indictment does not charge him with crimes directly related to Russia or with conspiracy to skew the 2016 election, but with what legal experts call 'process crimes'. He also claimed the heavily-armed manner of the arrest was unnecessary given that he doesn't own a firearm, doesn't have a valid passport and doesn't have a criminal history. 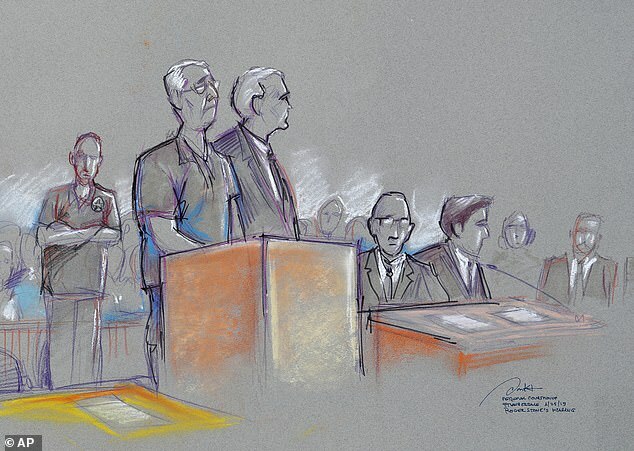 'Frankly, they just could have contacted my attorney and I would have voluntarily turned myself in,' Stone told Carlson. 'The proof of this is that only hours later the judge granted me a $250,000 surety bond because I'm not a flight risk. 'And as far as the government's contention that they were concerned that I would destroy evidence, they have been in my email and my text messages and my phone calls for two years - probably longer because the New York Times reported on January 20th, 2017, that I was among three people in the Trump campaign under active surveillance. He is referring to the leak of Hillary Clinton campaign chairman John Podesta's emails prior to the 2016 election. Text messages showed correspondence between Stone and Credico about the emails days before they came out. I'm in for the fight of my life. I will not quit. I will not fold. I will not bend. I will not bear false witness against the president. 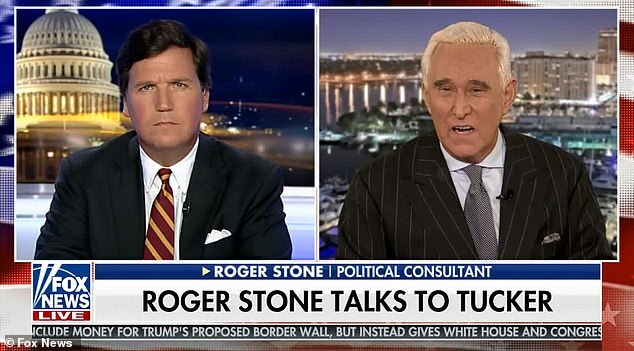 Stone continued: 'Look, Tucker, I think we both know the game here. Wear Stone down financially, make sure he is broke so he has to plead guilty to these charges, even though he didn't commit them. And then try to flip me against the president. He added: 'I'm in for the fight of my life. I will not quit. I will not fold. I will not bend. I will not bear false witness against the president. I intend to fight because this indictment is fabricated. 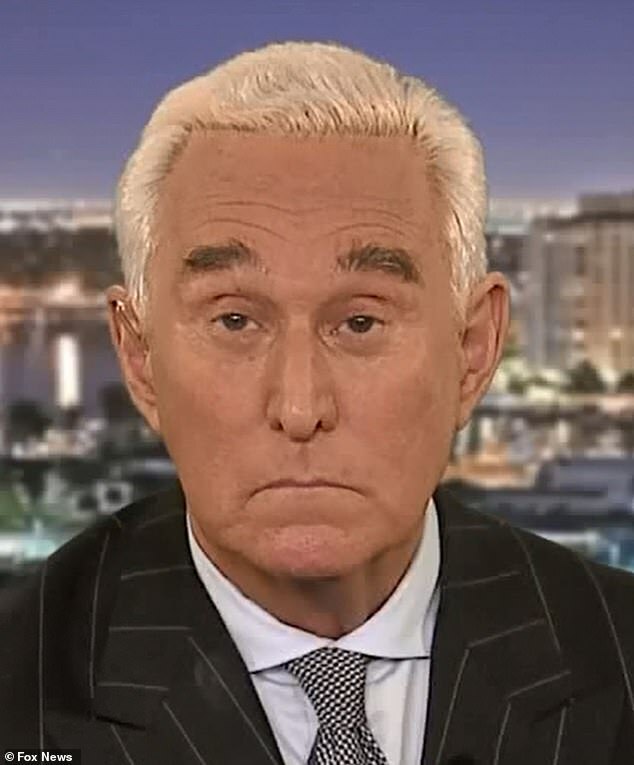 Just as he had on Fox, Stone closed the interview by reminding that he could use financial help in fighting his upcoming legal battle. 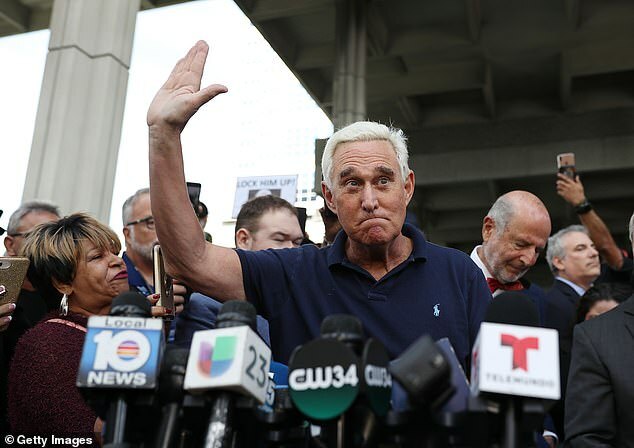 Stone emerged from the federal court building flashing a V-for victory with both hands raised, Richard Nixon-style, after appearing in front of a judge Friday afternoon. 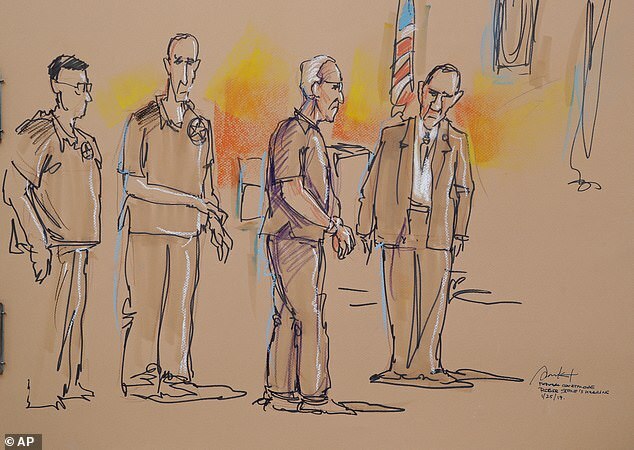 The FBI also raided Stone's Manhattan apartment, seizing hard drives and other materials.